In 1987, Dr. Azliyati Azizan graduated with a Master’s of Science degree in Microbiology from East Tennessee University (ETSU) in the United States. At ETSU, Dr. Azizan worked on a thesis project with Dr. Raymond Blevins entitled “Mutagenicity and antimutagenicity testing of six chemicals associated with specific spices as revealed by the Ames Salmonella mutagenicity assay In 1995”. 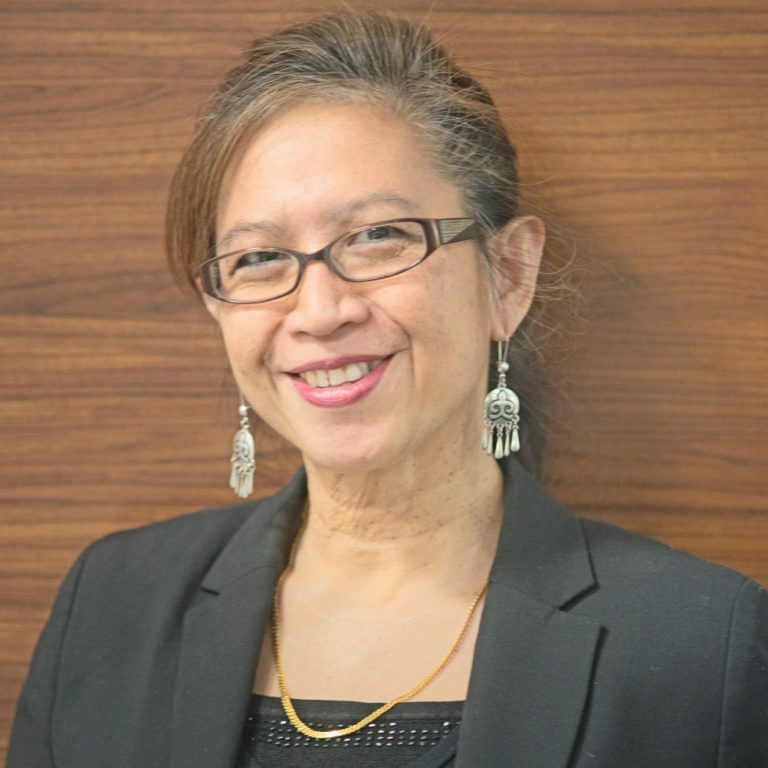 Dr. Azizan obtained her PhD in Biochemistry and Molecular Biology at the University of Tennessee; for her dissertation (1989-1995), Dr. Azizan worked with Dr. Paul Black on a project entitled “Molecular genetic analysis of the mechanism of long-chain fatty acid transport in Escherichia coli”. Dr. Azizan joined the laboratory of Dr. Peter Neame who was affiliated with the Shriners Hospital for children on the campus of the University of Florida (USF) in Tampa, Florida in November of 1994 as a post-doctoral fellow. She continued to work under the mentorship of Dr. Neame later as Research fellow Bioscientist on a project focusing on gene expression and elucidation of functional domains of a cartilage-derived anti-angiogenic factor known as chondromodulin-I (ChM-I) until 1996. In 2001, Dr. Azizan began as a part-time faculty member as an Assistant Professor at the University of South Florida (USF) in the Department of Environmental and Occupational Health and began teaching the Microbiology for Healthcare Worker course which was later offered in a web-based format, until 2014. During this time (2004-2007), Dr. Azizan also worked part-time as a Molecular Virology Bioscientist at the Florida Department of Health (FDOH) Bureau of laboratory (Virology branch) which is located on the USF campus in Tampa, Florida. At the FDOH laboratory, Dr. Azizan characterized real-time RT-PCR diagnostic assays to detect and identify viral pathogens from clinical samples as well as conducted research on norovirus and dengue viruses. When the new Global Health department was formed at the USF College of Public Health, Dr. Azizan joined as one of the founding faculty members who participated in developing the fastest growing department which recruited many masters and doctoral level students to the MPH, MSPH and PhD programs. Dr. Azizan’s duties as an Assistant Professor at the USF Department of Global Health included teaching, research, student advising, service, grant and manuscript writing, and interdisciplinary research collaborations. At USF, Dr. Azizan taught three graduate level courses and one undergraduate course and guest-lectured in several courses at the USF College of Public Health and the USF College of Medicine. Dr. Azizan currently maintains a courtesy faculty position with the USF Department of Global Health as well as the USF College of Pharmacy. Dr. Azizan had previously mentored many doctoral (Ph.D.) and masters level students and served as Academic Advisor for many MPH (Masters of Public Health) students. Dr. Azizan is a member of the American Society for Microbiology, the American Society for Biochemistry and Molecular Biology and the American Public Health Association. Dr. Azizan’s research training is in the area of Medical Microbiology, and Molecular Biology. In research, Dr. Azizan studied the immunopathogenesis of dengue hemorrhagic fever as well as has interests in areas related to vector competency and development of novel diagnostics for dengue viruses. International collaboration on other infectious disease topics with Colleagues at several other international sites including Kazakhstan and Malaysia are also ongoing. Collaboration for many years with Scientists at the Institute of Microbiology and Virology in Almaty Kazakhstan has resulted in publications and grant awards that supported projects related to characterization of novel antibiotics isolated from Actinomycetes obtained from extreme environments of Kazakhstan that are active against drug-resistant hospital-associated pathogens. This project continues to be developed and currently includes characterization of extremophile extracts that are active against drug resistant Mycobacterium tuberculosis that makes treatment of tuberculosis challenging. Dr. Azizan also has great interest in collaborating with Investigators who study microbial pathogens of global public health interest and their associated diseases particular those relevant to Kazakhstan and Central Asian regions. 1. Azliyati Azizan, Nicole Holaday and Peter Neame (2001) Post-translational processing of bovine chondromodulin-I. J Biol. Chem. 276 (26): 23632-23638. 2. Azliyati Azizan, Mark Sweat, Carlos Espino, Jennifer Gemmer, Lillian Stark, and Deno Kazanis. Differential Proinflammatory and Angiogenesis-specific Cytokine Production in Human Pulmonary Endothelial Cells, HPMEC-ST1.6R Infected with Dengue-2 and Dengue-3 Virus. Journal of Virological Methods 138 (2006) 211-217. 4. Ligia M. Cruz, Michael Allanson, Boo Kwa, Azliyati Azizan, and Ricardo Izurieta (2012) Morphological Changes of Ascaris spp. Eggs During Their Development Outside the Host. Journal of Parasitology: Feb 2012, Vol. 98, No. 1, pp. 63-68. 6. Srivastava A, Sweat JM, Azizan A, Vesely B, Kyle DE. (2013) Real-Time PCR to Quantitate Leishmania donovani in Hamsters. Journal of Parasitology. 2013. Vol. 99 No. 1, pp. 145-150. 7. Kurt Kesteloot, Azliyati Azizan, Richard Whitman, and Meredith Nevers (2013) Ever Changing Recreational Water Testing Alternatives. Park Science. Volume 29, Number 2, Fall/Winter 2012-2013. Area in Malaysia. PLOS ONE. Volume 9, Issue 4. March 2014, Volume 9, Issue 3. 11. Adeline S. L. Yeo, Nur Atiqah Azhar, Wanyi Yeow, C. Conover Talbot Jr., Mohammad Asif Khan, Esaki M. Shankar, Anusyah Rathakrishnan, Azliyati Azizan, Seok Mui Wang, Siew Kim Lee, Mun Yik Fong, Rishya Manikam, and Shamala Devi Sekaran. (2014). Lack of Clinical Manifestations in Asymptomatic Dengue Infection Is Attributed to Broad Down-Regulation and Selective Up-Regulation of Host Defence Response Genes. PLOS ONE. April 2014. Volume 9, Issue 4.